Self-Assembly Processes at Interfaces: Multiscale Phenomena provides the conceptual and unifying view of adsorption, self-assembly, and grafting processes at solid–liquid and liquid–gas interfaces, also describing experimental methods where applicable. An invaluable resource for (post)-graduate students looking to bridge the gap between acquiring the field’s existing knowledge and the creation of new insights, the book recalls fundamental concepts, giving rigorous, but first-principle-based, calculations and exercises, and showing how these concepts have been used in recent research articles. Readers will find guidelines on how best to start research in the field of surface chemistry with biological macromolecules and molecules able to undergo self-assembly process at interfaces in the presence of a liquid, along with discussions on the very fundamental aspects and applications using concepts of biomimetic chemistry. 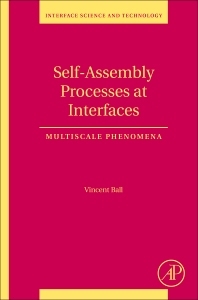 By highlighting the interdisciplinary aspects of the field of self-assembly at interfaces, the book is an ideal resource for chemical engineers, chemists, physicists, and biologists. In addition, important equations are demonstrated on the basis of fundamental concepts, and overly complex mathematical developments are avoided. Dr. Vincent Ball is a Professor at the University of Strasbourg, INSERM, Strasbourg, France. He is the recipient of a 2007 Fulbright fellowship, and was an invited researcher at the Michigan University, Ann Arbor, Department of Materials Sciences, Chemical and Biomedical Engineering, and an invited researcher at the Max-Planck-Institut für Polymerforschung, Mainz, Germany.